Another crazy week in commodities with precious metals and precious metal stocks surging higher on heavy volume, while natural gas and crude oil move lower. Money seems to be rotating out of energy and into precious metals. Gold jumped higher today breaking out of its 6 month pennant pattern. If prices can hold into the weekend then I expect the $1000 per ounce to be reached quickly. 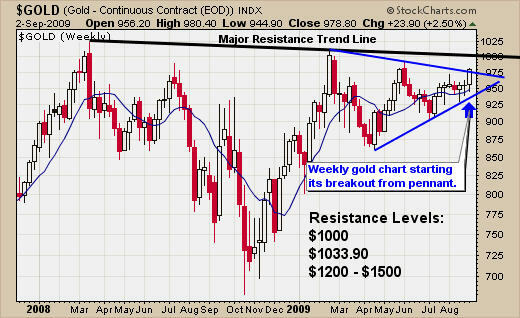 Also Gold stocks took off like rockets, which are a strong sign that gold will follow through on this breakout. It will be interesting to see what happens from here. 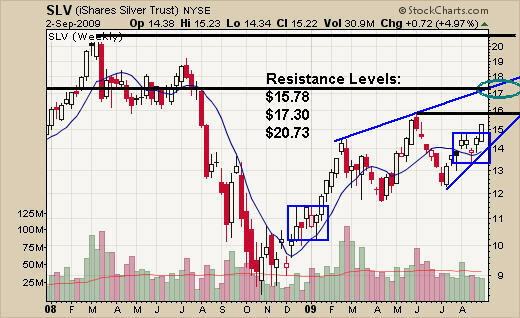 Silver and silver stocks are shooting higher as well. Natural gas continues to trade lower. 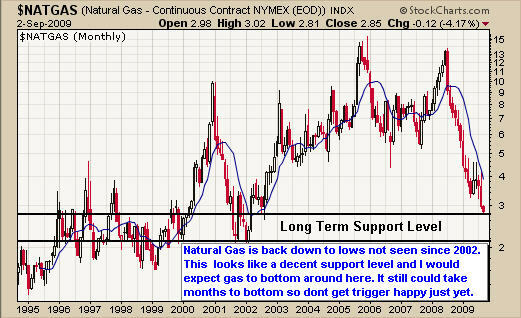 The good news is that the price of natural gas is now at a major support level, which was formed as far back as 1996. The weekly natural gas chart shows much of the same price action that oil had before reversing to the up side in February of this year. I would not be surprised, if we see buyers stepping into natural gas at this level. 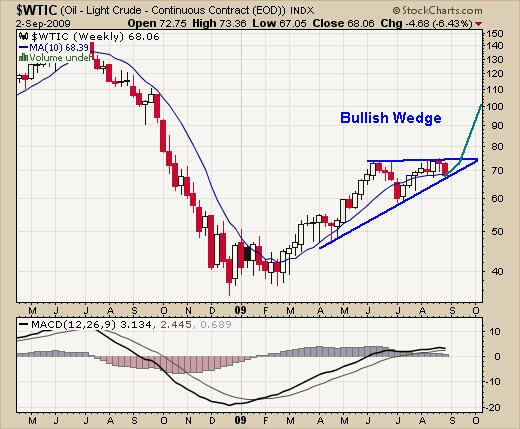 Crude oil continues to trade within its bullish wedge pattern. We will be looking for a low risk entry point for oil this month using the daily chart. Precious metals are showing strength while the energy sector continues to have selling pressure. Gold, silver, natural gas and oil look ready to make big moves in the coming weeks and, being positioned on the right side, will generate some massive profits. Staying focused for low risk entry points is important when volatility and emotions are running high. The excitement/stress for traders this week is very high. With precious metals and precious metal stocks breaking out today on massive volume, it has traders excited or in a panic, if they are not positioned yet. To add more fire to the week, natural gas continues to fall, triggering a panic sell reaction by many investors/traders. I do like precious metals as a bull play here, but risk is a little higher than I would like. The past couple months precious metals have been jumping around like a yoyo, making it very difficult to find a low risk entry points. I know many traders are in serious pain, because they bought natural gas a couple months ago, expecting a rally which did not happen. I would like to mention that I am seriously starting to think about scaling into Natural Gas over the next 1-2 months. Natural gas reminds me of a Canadian fund XTR, which I scaled into last February and am now sitting with a very healthy gain, not to mention a 16% dividend. I feel Nat Gas will pay off huge over the long run, but it will take some time to bottom.